Resistors are among the most popular electronic components around because they’re simple yet versatile. One of the most common uses of a resistor is to limit the amount of current in part of a circuit. However, resistors can also be used to control the amount of voltage provided to part of a circuit and to help create timing circuits. 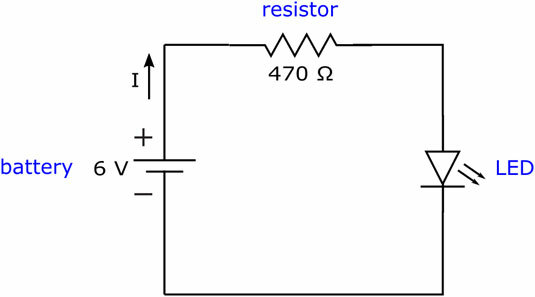 The circuit in the following figure shows a 6-volt battery supplying current to a light-emitting diode (LED) through a resistor (shown as a zigzag). LEDs (like many other electronic parts) eat up current like a kid eats candy: They try to gobble up as much as you give them. But LEDs run into a problem — they burn themselves out if they draw too much current. The resistor in the circuit serves the useful function of limiting the amount of current sent to the LED (the way a good parent restricts the intake of candy). The resistor limits the amount of current, I, flowing into sensitive components, such as the light-emitting diode (LED) in this circuit. Too much current can destroy many sensitive electronic components — such as transistors and integrated circuits. By putting a resistor at the input to a sensitive part, you limit the current that reaches the part. (But if you use too high a resistance, you’ll limit the current so much you won’t see the light, although it’s there!) This simple technique can save you a lot of time and money that you would otherwise lose fixing accidental blow-ups of your circuits. 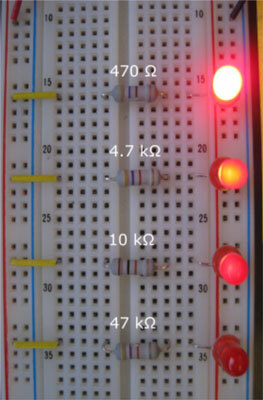 You can observe how resistors limit current by setting up the circuit shown and trying out resistors of different values. Use alligator clips or a solderless breadboard to set up the circuit (see the following figure), starting with the 470 resistor. Remember to orient the LED correctly, connecting the shorter lead of the LED to the negative battery terminal. Don’t worry about the orientation of the resistor; either way is fine. Note how brightly the LED shines. Then remove the resistor and replace it with the other resistors, one at a time, increasing the amount of resistance each time. Did you notice that the LED shines less brightly each time? That’s because higher resistances restrict current more, and the less current an LED receives, the less brightly it shines. Two ways to set up the resistor-LED circuit. 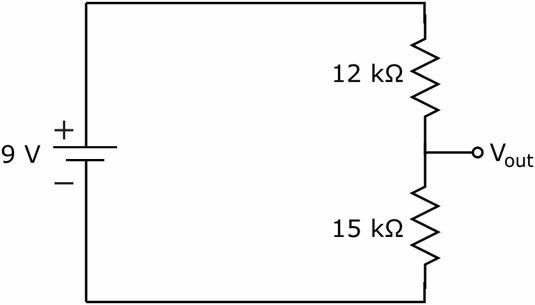 The following figure shows a parallel circuit in which each branch contains a different value of resistance. For higher values of resistance, the current that passes through that branch is restricted more, so the LED in that branch emits less light. Higher values of resistance restrict current more, resulting in less light emitted from the LEDs. Resistors can be used also to reduce the voltage supplied to different parts of a circuit. Say, for instance, you have a 9-volt power supply but you need to provide 5 volts to power a particular integrated circuit you’re using. You can set up a circuit, such as the one shown here, to divide the voltage in a way that provides 5 V at the output. Then — voilà — you can use the output voltage, Vout, of this voltage divider as the supply voltage for your integrated circuit. Use two resistors to create a voltage divider, a common technique for producing different voltages for different parts of a circuit. Two ways to build the voltage divider circuit. as shown. Measurements show that the actual battery voltage is 9.24 V and Vout is 5.15 V.
Measure the total voltage supplied by the battery (left) and the voltage across the resistor (right). You can also put a resistor to work with another popular component — a capacitor — to create predictable up and down voltage swings. You’ll find the resistor-capacitor combo helps you create a kind of hourglass timer, which comes in handy for circuits that have time dependencies (for instance, a three-way traffic light).